Patricia King: "GET READY FOR A BREAKTHROUGH IN INTIMACY--UNLIKE ANY OTHER YOU'VE EVER HAD!" "The daily prophetic words that are sent to our 132,000+ subscribers are made possible by the purchase of products like those featured in this email. You may purchase them directly from this email, or visit our online store at www.elijahshopper.com." I am very excited about this month's devotion: "Breakthrough in Intimacy." Steve and Lisa Swanson oversee our worship and arts department. They are an amazing couple and both very gifted. Steve Swanson, worship leader, musician and song writer, has prepared this month's devotion. It will touch you deeply...it did me! "Get ready for a breakthrough unlike any other you've had in the past." You may have had breakthrough in your finances, or in other areas of your life, but this is a breakthrough into intimacy. That's right, the King Himself has invited you into His chambers to tell you the secrets of His heart. The Lord is about to woo you into deeper levels of love, revelation, and passion. You're breaking through a barrier of flesh, and entering a new season of relationship with the Lover of your soul. You may have distanced yourself from Him because of fear, or doubt of where you stand in your relationship with Him. Today the Lord says, "Let My perfect love cast away all your fears." Drop any pre-conceived notions you may have in your arms now and prepare for a full embrace with the King. The secret is out. The Lord wants relationship with us so badly, He would die just to be with us. In fact, He did. The cross made a way for us to enter into His chambers and abide in His presence. Let's look at Hebrews 10:19-20, where it says, "Having therefore brethren, boldness to enter into the holiest by the blood of the Lamb, by a new and living way, which He has set apart for us, through the veil that is His flesh." The only thing in the way now is us. Given this truth, when we come to worship Him, we must believe that we have access to His presence, His heart, His Kingdom, His rest, and His revelation. He wants to share His secrets with us! He takes such delight in our desire to know more about Him. A parent loves when a child takes interest in where they came from, or stories that only family members would know. So does our Heavenly Father. He loves for us to inquire of Him. Psalm 27:4 says, "One thing I have desired of the Lord and that I will seek, that I may dwell in the house of the Lord forever, to behold His beauty and to inquire of Him in His temple." Can you imagine how the Lord must feel when we inquire of Him? He might say something like, "I'm so glad you asked of Me, now that you're here, I can't wait to show you some other things too, I've just been waiting for you to ask." Deuteronomy 29:29 states, "The secret things belong to the Lord, but those things which are revealed belong to us and our children forever." He's ready to reveal His heart to you--His heart that burns with passion for your affection. So next time you come to worship Him, "ask." Ask of Him, to reveal the secrets of His heart. Ask Him to unveil deep truths about His nature, His character, and His passion for you. He's just waiting to hear that sound of inquiry. Your Father loves you. He wants to spend time with you. He loves to be with you and share His heart with you. I encourage you to take the time, and really let the following chapters minister to you. May they reveal truths about your Savior, Bridegroom, and your King. Psalm 27, Psalm 91 (especially verses 14-16, His response), Psalm 84, and Hebrews 10. So draw near to Him and He will draw near to you! 5671-Western Ave. NW; Washington, DC. • Godly power & satanic control. • Supernatural visitations & occult experiences. Christians no longer need to sit idly by while the world is bombarded with new age practices, witchcraft, and Satanism. No matter whom you are or where you live, you play a vital role in establishing God's plan for the earth. 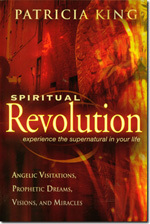 Join the "Spiritual Revolution!" Author, teacher, and prophet, Patricia King, sounds the alarm for believers to entertain angelic creatures and slay the dragons. She leads you into the spiritual dimension where you will discover the glorious "Third Heaven" through the power of the Holy Spirit. Enlist in the "Spiritual Revolution," and you will be transformed into a powerful witness throughout an eternal lifetime. For many years we have believed that those truly hungry for the Lord Jesus would simply come into our church buildings. We have forgotten that Jesus shined among those who needed Him most by being among those who needed Him most. Patricia King, who has ministered for over 20 years, reaching the places most would never go, reveals the power of bringing God's glory into missions, media, the marketplace and the whole world, including your corner of the world! The next great move of the Holy Spirit will not be found in the sanctuary, but in the secular arena. The Church is about to receive new wine in a new wineskin as a witness to the world. 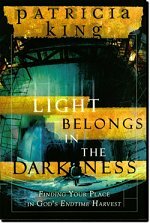 Your light belongs in the darkness! This CD is sure to take you into the glory and presence of God. Todd says he believes this is his best and most anointed CD project so far. In this recording, you will hear Todd speaking powerful soaking prayers over inspiring instrumental sounds and sweet female vocals. This CD is recorded for those who want to be saturated with the presence of the Holy Spirit, and it is for those whose hearts long for deep intimacy with Jesus. While recording this CD, Todd experienced visions and visitations of the Supernatural Realms of Heaven. Todd and his father Dave Bentley, as well as others present in the recording studio, felt the tangible presence and anointing of the Lord in a new and exciting way. The tangible presence and anointing is definitely captured on this special recording.